The nasal septum is a wall that separates the left side of the nose from the right side. You may have heard of a "deviated" septum, wherein the septum doesn't sit exactly in the middle, between the two sides. In that circumstance, the deviated septum can obstruct the free flow of air through the nose, and a "septoplasty" operation can be performed, to straighten the crooked or deviated septum. A septal perforation is a hole in the nasal septum. It can occur as a result of previous nasal surgery, or as a result of a nasal fracture, and there are many more causes as well. A septal perforation is often thought of as resulting from cocaine use, but it takes a lot of money worth of cocaine to cause a hole in the septum, and trauma or previous surgery are much more common causes. The photograph below shows a septal perforation. We are looking into the patient's right nostril. The Q-tip was placed into her left nostril, but we can see the Q-tip through the hole in her septum. The septal perforation can cause several problems. The perforation, or hole, can collect crusting (also known as boogers) along its rim. The edges of the perforation can bleed. Air passing through the perforation can whistle noticeably. Also, air passing through the perforation causes an increase in air turbulence, which the patient perceives as obstruction. The crusting can exacerbate the obstruction problem. The septal perforation can grow slowly over time. If it is close to the bridge of the nose, the bridge may collapse, making the nose look as if there were a dent along the bridge. 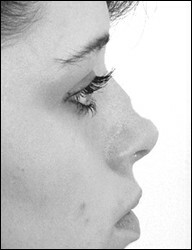 The perforation can complicate a rhinoplasty. For example, if a hump is removed from the nose, after surgery there may be too little septal cartilage supporting the bridge of the nose, and the bridge may collapse, causing a dent. The two diagrams below represent a hypothetical hole in the septum that is too close to the nasal profile after removal of a hump, and the resulting collapse of the nasal bridge. A septal perforation can be closed surgically, but it is often a difficult procedure. A skilled surgeon can routinely close a perforation that is less than one-half inch in diameter, but perforations larger than that size can be exceedingly difficult to close, and not every nose surgeon has the technical dexterity to accomplish that task. If a perforation has been present for a long time without growing, and it doesn't cause the patient any symptoms, and it's not of a size or position to interfere with the rhinoplasty operation, it's okay to proceed with the rhinoplasty without fixing the perforation. 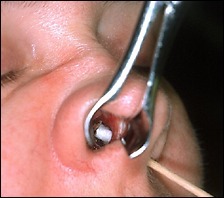 Otherwise, the perforation should be closed before the rhinoplasty. But make sure that the doctor who helps you with that decision is the doctor who can close the perforation, not the doctor who will perform the rhinoplasty. The rhinoplasty doctor could be motivated to perform his operation, and let you deal with the consequences of the still-present perforation later.